Stevie Wonder is one of the most acclaimed and successful artists of the late 20th century and was a defining force in the musical landscape of the 1970s. This Feature Friday focuses on his eighteenth studio album, Songs in the Key of Life, released in 1976. Before the release of this album, Wonder was on a hot streak in the prime of his musical career, winning Grammys for his last two albums in a row; Innervisions (or streaming with AU login) released in 1973 and Fulfillingness’ First Finale (or streaming with AU login) in 1974. Songs in the Key of Life came after a long wait two years later- packaged as a double album with a bonus EP, boasting 21 songs total. The album effortlessly blends pop, funk, jazz, and Latin styles: to call it musically diverse would be an understatement. Over 100 musicians are credited in the production of this album, explaining in part the long wait before the release. It debuted at No.1 in September and stayed for the rest of the year until it was best in January of 1977 by Hotel California. 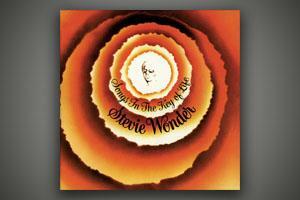 The breakout hits on the album include “Sir Duke”, a tribute to Wonder’s musical influences written shortly after the death of Duke Ellington; “I Wish”, a nostalgic upbeat song about the singer’s childhood; and “Isn’t She Lovely”, a ubiquitous tune about the birth of Wonder’s daughter Aisha. But these are far from the only gems on the record, from the fusion-frenzy of “Contusion”, to the recognizable and influential “Pastime Paradise”, to the Brazilian-influenced love/heartbreak song “Another Star”, this album spans genres and topics like few others. Wonder was also a noted political activist, campaigning to make Martin Luther King Jr.’s birthday a holiday in the United States and raising money for AIDS awareness and famine relief. These desires to enact change in the world are reflected in a number of songs on this album, including “Village Ghetto Land”, depicting scenes of poverty, inequality, and despair; set to a deliberately ironic background of mock-classical synth strings. “Black Man” serves as a history lesson detailing examples of contributions to global progress from people of a variety of cultures and backgrounds. In addition, general messages of positivity and love permeate the album and provide counter-narrative to the negativity surrounding the mid-70s, with some examples being “Love’s in Need of Love Today, and “Ngiculela—Es Una Historia—I Am Singing" which features verses in Zulu, Spanish, and English. Stevie Wonder’s massive influence on pop, funk, r&b, and soul music can still be seen today, and this album represents some of his all-time finest work. The American University Music Library is home to a copy of this album, as well as several other amazing Wonder records.